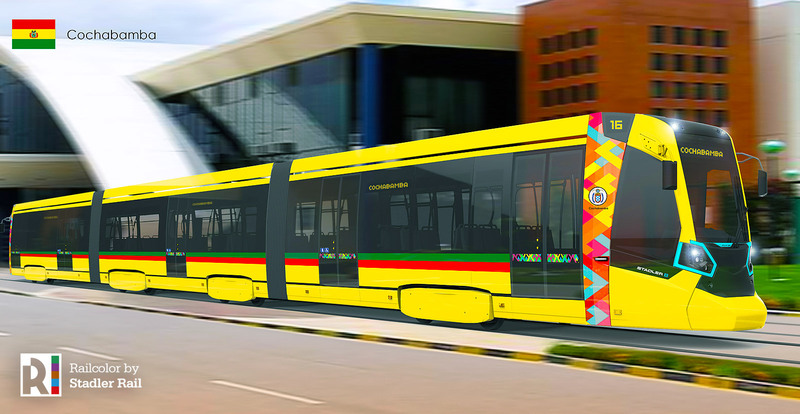 For the first timeAgain, electric trams will be operating in Bolivia. The Metelitsa type model will have a capacity of up to 200 passengers and will be in commercial service by 2020. Edit: Both La Paz and Cochabamba (1910-1948) had electric street cars in the past. The Swiss rail vehicle manufacturer Stadler has been awarded the contract to manufacture and deliver 12 trams for the Cochabamba Metropolitan Train project. The order has been granted by The “Asociación Accidental Tunari” formed by the Spanish construction company JOCA, a company of the ICADI Group, and the Swiss Molinari Rail AG. The contract has been signed on 26 February, 2018. The delivery of the Metelitsa vehicle is planned for August of next year. According to the contract Stadler will also support the Asociación Accidental Tunari with the technical maintenance of the trams for three years. The vehicle will link the municipalities of Sacaba, Cercado, Colcapirua, Quillacollo, Vinto and Sipe Sipe in the Department of Cochabamba, providing transport services to more than 1 million people. The trams will be assembled in a European factory and, once verified, disassembled by modules and shipped to Cochabamba. The shipment of the tram modules is estimated to last one and a half month. The 3-car low floor trams are of modular buildup with a track gauge of 1,435 mm, a total length of 33 meters, width of 2.50 meters, height of 3.60 meters (pantograph not including), a capacity for up to 200 passengers and space for four wheelchairs, which can be increased. A special feature of this lightweight tram is its designed maximum speed of 80 kilometers per hour. The vehicles will have doors on both sides of the car. JOCA, the Spanish construction company belonging to the ICADI Group, and the Swiss Molinari Rail AG, started to work on the metropolitan train for Cochabamba (third largest city in Bolivia) in August of last year. The project commencement was preceded by the provision of all guarantees and compliance conditions of the competent authorities required in the bidding process, as well as the formalization of the aforementioned contract. It is a 3-year contract granted within an international tendering procedure. It will be financed by the General Treasury of the State of Bolivia and executed by JOCA and the Swiss company Molinari Rail AG.